This award-winning campaign was birthed out of an ambitious idea for a single assignment that Laura and I created over coffee. Michigan Smart Coast—an economic development initiative trying to draw young talent to work and settle along the Michigan lakeshore—came to us with a request to make a “Summer Intern Events” brochure. Laura used that “double” idea to generate fresh and vibrant collages of recreational and career photography. 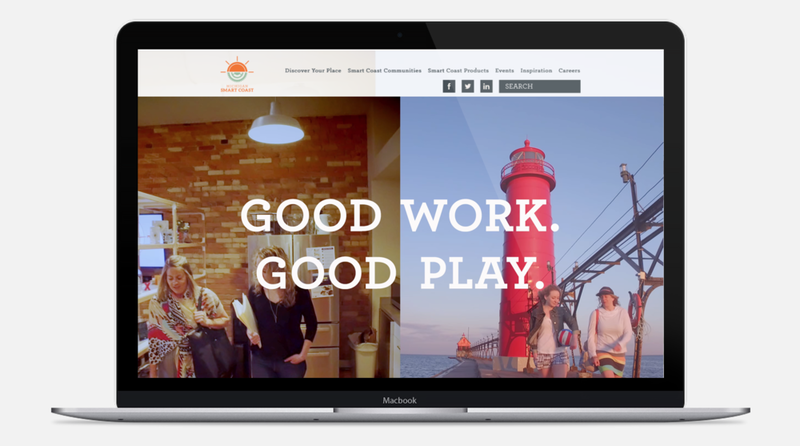 From there, our ideas exploded, eliciting enough interest and excitement that Michigan Smart Coast kept returning to round out the identity further—through banners, SWAG, social media assets, website planning and more. The mark is now garnering support from businesses around the area and continues to resonate with a generation eager to land a great career during the day and head to the beach with their friends after 5.